What is pediatric neuroblastoma and how is it treated? Neuroblastoma is a disease in which cancer cells form in the nerve tissue of the neck, chest, spinal cord or the adrenal gland. Symptoms vary, depending upon where the tumor is located. Parents often discover a lump or mass in the abdomen, neck or chest, or notice skin lesions while bathing their child; or the child may complain of pain in the chest or limbs, or have difficulty breathing. The majority (60%) of Neuroblastoma diagnoses are Stage 4, where the cancer has spread throughout the child’s body. Diagnosing this deadly pediatric cancer is often difficult as most children are symptom-free until the cancer has spread already. Louis Unger was a typical case where he had some symptoms, such as limping and lack of energy. Because cancer is such a rare diagnosis parents and pediatricians often relate these symptoms to other factors, such as a cold or minor play injuries. Although not enough is known about the why and how of the spread of Neuroblastoma it is clear that the cancer begins as a small tumor, often on the adrenal gland and at some point spreads very rapidly in the child. When this rapid spreading occurs the symptoms increase at the same rate and the child is now very, very sick. When Louis was diagnosed he was a different child which alarmed his parents greatly. An initial blood test detected extreme anemia (very low red cell blood count), which caused Louis to lose most of his energy. Red blood cells carry vital oxygen to the body and brain. Red blood cells, of which every person has 20-30 trillion, are continuously produced in the bone marrow. As Neuroblastoma spread in Louis’s body the cancer quickly started growing tumors in his legs, spine and hips. These bones are large and therefor produce a great deal of red blood cells. As the Neuroblastoma grew in these bones the bone marrow was displaced and eventually replaced by the cancer, causing the severe anemia. Neuroblastoma is the third most common childhood cancer (after leukemia and brain cancers), representing 7% of all childhood malignancies or roughly one in every 100,000; approximately 700 new cases are diagnosed in the U.S. every year. It is one of the most deadly however, with average survival rates of 20-30% for the most aggressive type of this cancer when Louis was diagnosed in 2001. This rate has improved to 40-50% today due in part to new treatments that Louis trail blazed during his battle with the cancer. how quickly the tumor is growing. The appearance and histology of the tumor. When Louis relapsed with a brain tumor the doctors told them that no one had ever survived this type of relapse. 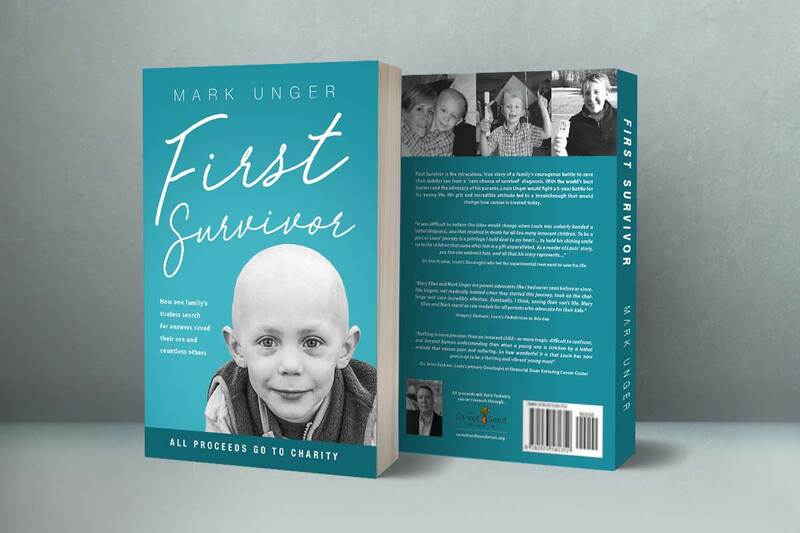 Someone had to be the first to break through to be the “First Survivor.” They are fortunate that with the help of talented and innovative doctors, advocating by Mark and Mary Ellen, and a lot of hope, Louis is with them today, as are over 60% of children that relapse with a Neuroblastoma brain tumor now. "I had a bad feeling when we drove the twenty minutes to Yale. Mary Ellen was worried, of course, but Louis was being tested for cancer, full battery of scans, bloodwork, biopsy once a month so I wasn’t expecting the brain tumor, how would that not have shown up in the testing? Now we stared at each other again and our thoughts instantly crossed—this is bad, very bad. My mind was racing. Your purchase supports neuroblastoma research through the Band of Parents foundation.